The saying, “Eat breakfast like an emperor, lunch like a king and dinner like a pauper” fits perfectly with a modern healthy lifestyle. 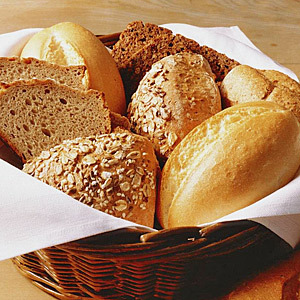 In Germany, bread plays an important role in all three meals, and healthy wholegrain breads are widely found. The least caloric, nutritionally dense breads in this category are Fitnessbrot, or Vollkornbrot (whole grain breads), Zwieback (rusk) and Knäckebrot (crisp breads) which can be found at most specialty stores, supermarkets or online in the United States. Germans munching on Frühstücksbrötchen (breakfast rolls), crusty rye bread sandwiches with butter at breaks (Pausenbrot or Butterstulle) and Abendbrot as part of a light supper. This month we want to recommend three healthy wholegrain bread choices for those who want to loose a few pounds or eat a balanced diet. These moist and flavorful breads are made from healthy whole grains like rye, spelt, barley and seeds like sunflower, flax or pumpkin. Try them at breakfast; they’re especially tasty served toasted with butter, jam or honey. Or later in the day as the base for an open-faced sandwich with Bavarian blue cheese topped with sliced radishes. (For more inspired sandwich ideas, visit our Abendbrot recipes page). A large assortment of delicious and healthy German Vollkornbrote (whole grain breads) is available in North American grocery stores. By German law,Vollkornbrote must contain over 90% whole grains, which means that the germ (Keimling), bran Schale, and endosperm (Mehlkörper ) are still intact. This healthy fiber requires a long time for your body to fully digest, so you’ll feel full for a longer time and eat less over the course of the day. In contrast, an average piece of toasted white bread, bagel or English muffin contains only ground endosperm, which is pure starch and burns quickly in the body after it’s eaten. This means that after a short sugar high your body will crave more food and you’re likely to eat more over the course of a day. Nutrition experts have long advocated for higher consumption of whole grains. Research shows that regular consumption of whole grains in various forms will reduce the risk of heart attack or stroke and certain forms of cancer by over 30%. Whole grains are loaded with nutrients like vitamin E and the B complex, minerals such as selenium, zinc, copper, iron, magnesium and phosphorus, as well as protein, complex carbohydrates and beneficial plant phytoestrogens. All of these nutrients work together to promote health. For those without the time or skill to make whole grain bread at home, Germany’s leading brand, Mestemacher, is widely available in Whole Foods and other grocery stores in North America and online. Mestemacher is a favorite of athletes all over the world. Their Westphalian Pumpernickel and Flaxseed breads are baked in a special two step process that ensures that the breads remain fresh tasting and moist and have a long shelf life without any preservatives, additives or stabilizers. Most Mestemacher varieties are also wheat free. This dry, crispy German toast is similar to the English rusk, and cousin to the Italian biscotti and French biscotte. Zwieback is a favorite food for teething babies and makes a great breakfast food and snack for all. Zwieback stands for ‘zweimal gebacken’ (baked twice). The second round of baking reduces Zwieback’s water content to only 4% — compared to 45% in regular bread — preventing mold and spoilage. Moreover, Zwieback contains relatively little fat and no sour dough, which makes it easily digestible for people with sensitive stomachs. In Germany, the Brandt brand is synonymous with Zwieback. 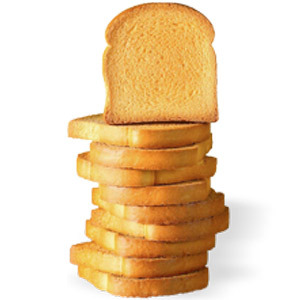 The classic Brandt Zwieback toast, made with locally grown Westphalian wheat has a faint roasted aroma, light crunchy texture and just the right amount of sweetness. Zwieback is such a celebrated part of German culinary tradition that it has its own museum, the Zwieback museum in Hagen, in the center of the Westphalia region. Zwieback with fresh butter and jam is a convenient and delicious breakfast treat. Two of these toasts with any topping provide a morning energy burst with far fewer calories than an egg muffin from fast food joints. Zwieback is also used as an ingredient in cake, soup and dumpling recipes. This no-fat Scandinavian version of dry, long-life bread is perfect for serving at Abendbrot. 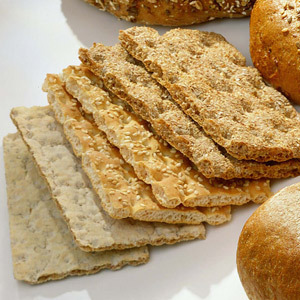 Knäckebrot combines rye and wheat, and is usually made from whole grains. The best known brand for Knäckebrot is Wasa, an iconic Swedish brand now owned and managed by Italian pasta producer Barilla S.p.A. Many Wasa varieties available in North America are made at the company’s production facility in Celle, Germany, near Hannover. Wasa’s sour dough and rye varieties are especially delicious with Black Forest ham, Castello Alpine cheese, fresh cucumber slices or pickles. Or, top a slice with German sauerkraut and cheddar and briefly broil under high heat. Also check out their new product, wafer thin flatbread crisps with rosemary, sesame and other flavors. Of course, those who have spent some time in Germany know that the cornucopia of breads in Germany seems to be endless. You can find 300 bread types and over 1,200 different rolls and bread products. And you won’t have to look hard to find them. It seems like there are Bäckereien (bakeries) on every street in every village, town and city.